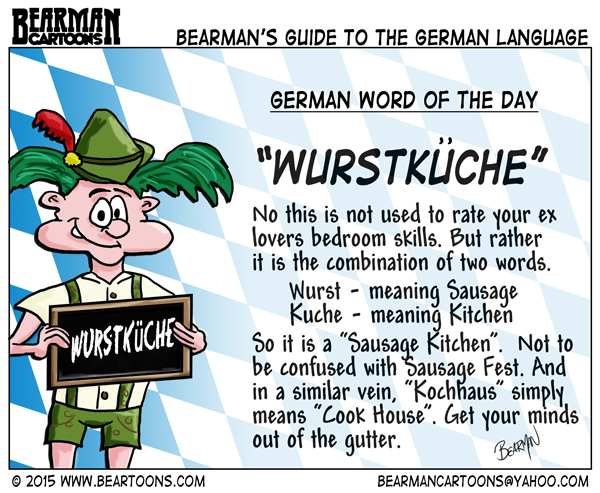 Wurstküche is the final word in the Understanding German series. Actually my wife pointed this one out to me and in my mind I am positive I am pronouncing it wrong. If you missed any of the other words in the series they were: Shmuck, Rathaus, and of course Ausfahrt. I hope you learned something. Now we need a German cartoonist to do a similar series on American words that just don’t translate well. You should have a ‘German Sentence of the Day’ now and combine some of these words. Now I’m hungry for German food. I love German food. I didn’t think I would given what they serve in US German Restaurants but it was delish!! Maybe they call sausage that because they know what’s in it. So if Bearman goes to a Biergarten would he become Bierman?